As a child, Alvar Agustí, MD, PhD, was not drawn to medicine like his father, who was a well-respected pulmonologist in Barcelona, Spain. A product of the space age, Dr. Agustí had lofty dreams of becoming an astronaut. Yet around the time he graduated from high school this was a long shot, as the country was just leaving the obscure dictatorship of General Francisco Franco. In part from necessity and in part moved by scientific curiosity, he enrolled in medical school and was quickly attracted to the physiology of pulmonary medicine. In particular, he gravitated toward gas exchange in normal and pathological conditions. He was able to explore this in his fellowship with professors Robert Rodriguez-Roisin, MD, PhD, of the University of Barcelona, and Peter Wagner, MD, and John West, MD, PhD, of the University of California. He completed his training in 1985, with a PhD dissertation on what is now known as hepato-pulmonary syndrome. Soon after, Dr. Agustí moved to Chicago, Illinois, to start investigating peripheral tissue (not pulmonary) gas exchange in what became one of the most rewarding periods of his career. 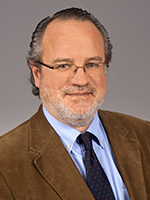 From 1989 to 1991, brought under the wing of Paul Schumacher, PhD, current editor-in-chief of the American Journal of Respiratory Cell and Molecular Biology, Dr. Agustí contributed to the development of an in vitromodel of tissue hypoxia. In 1991, he returned to Spain and moved to Palma de Mallorca to build a modern pulmonary service and research program from the ground up. He applied the new knowledge obtained in Chicago to two different clinical models of tissue hypoxia: continuous, as it may occur in some patients with COPD, and intermittent, as it happens in patients with sleep apnea (which was little known at that time). This led him to enter the world of systemic inflammation, comorbidities, exacerbations, and treatment effects. In 2009, he settled back in his hometown, Barcelona, where he currently serves as director of the Respiratory Institute at Hospital Clinic. In the last decade, Dr. Agustí has pioneered the application of network approaches to the complexity of chronic diseases, mainly COPD, and helped to move the field towards precision medicine. Bart Celli, MD, a fellow physician and COPD researcher at Brigham and Women’s Hospital and professor at Harvard Medical School, admires his innovation. Dr. Celli also credits Dr. Agustí with contributing to the understanding of immunologic mechanisms of COPD, as well as abnormal lung development, and accelerated aging with abnormal repair. Of course, some projects were unsuccessful in his 40 years as a researcher. Yet he remains optimistic and says that failure is exactly the time when scientists must keep working. “We have to keep re-examining the problem until we find new avenues,” says Dr. Agustí. Unfazed by setbacks, that same steadfast curiosity from childhood accompanies his present-day work at the research bench. And his profound love of science still drives him. Dr. Agustí’s other loves include his wife and three, now grown-up, children. Since leaving a promising career as a young tennis player in the late ‘70s in Barcelona to become a doctor, he now plays more occasionally that he would like. His new hobbies include going to the cinema, listening to a lot of classical music, and reading. His top picks for 2016 include: Homo Deus and Sapiens, both by Yuval Noah Harari.